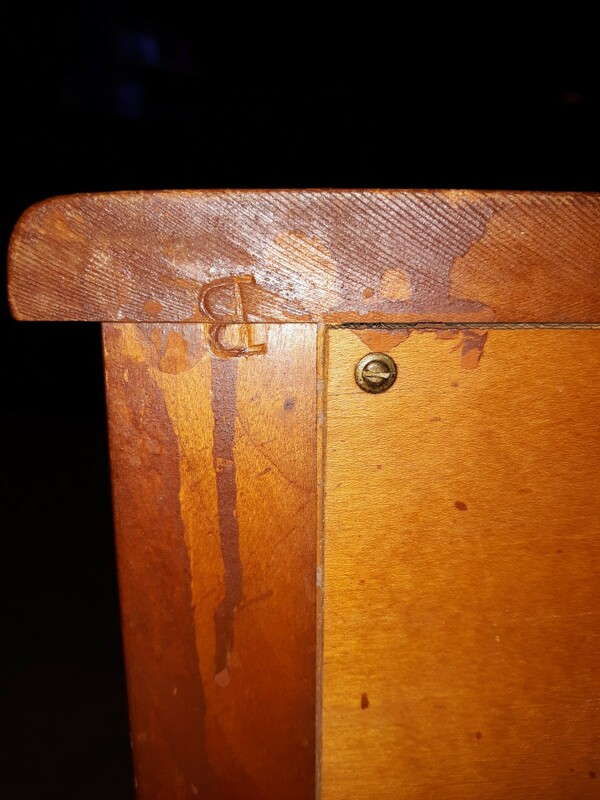 I have this rather old, small table that isn't in the best shape. I am just curious if anyone knows what I have. It could be junk, or maybe not. It has a "B" sort of etched in the back of it. There are no other markings. 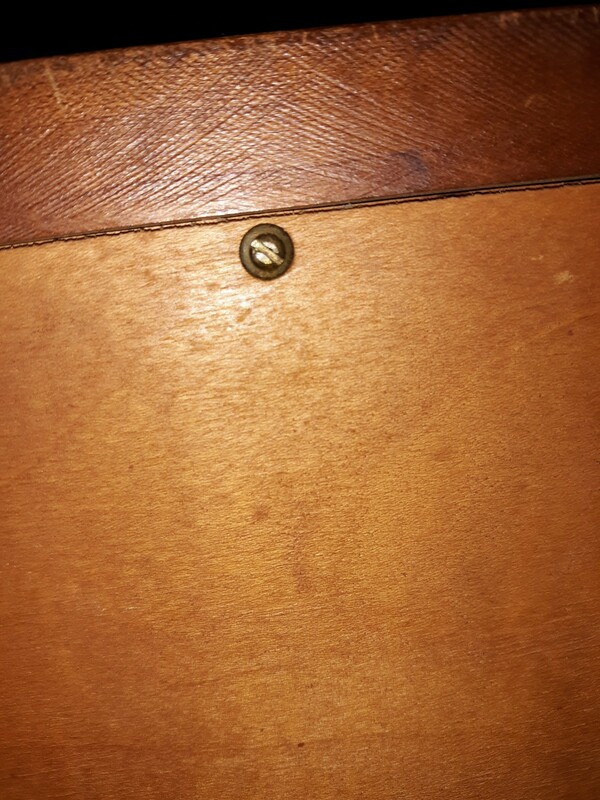 The screws in the back look brass? Any input would be appreciated. I found one very similar on Etsy, and it is going for $165.00. This is a very pretty end table. I think you could get $75 for it, based on condition. I do not recognize the B marking. This is an interesting little piece! I can't identify the mark. 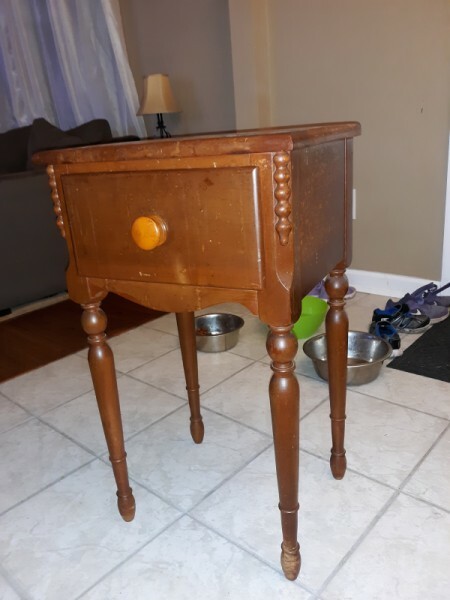 If it is truly old, you would be best suited by taking it to a reputable antique or furniture dealer and having them give you their take on it. None of the pieces on eBay at the moment match the lines of this piece and my preferred method to quote values is to find exact, apples to apples matches (down to the mark and hardware). That will give you the current market value. 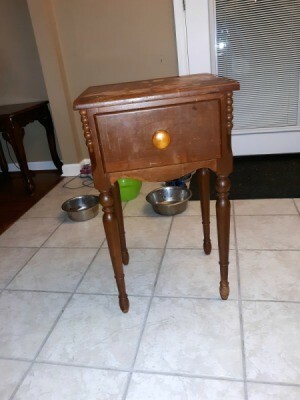 Pieces like this one are typically not altered so you could find a compaeabel online soon The slight differences would be stain color (darker or lighter) or slightly different hardware. There was an exact shape and similar hardware match to yours on Chairish or one of those sites "repourpose" type sites, where someone said it was a 1991 piece and it had been whitewashed and they were selling it for under $100. That is NOT a comparable piece because it was very significantly altered. If an antique dealer can't show you an exact match/value, perhaps they can show you pieces from the line and give you a good guesstimate on selling price where you live. I am curious to hear what a dealer tells you!! Please post back with what you learn. Thanks!